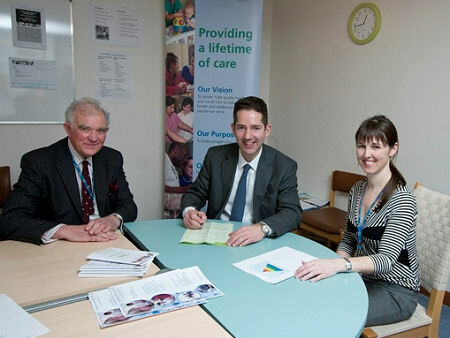 On Friday 25 February, Jonathan Djanogly, MP for Huntingdon visited Cambridgeshire Community Services NHS Trust’s musculoskeletal physiotherapy department, met staff and patients, and signed up to become a member of its aspirant community NHS Foundation Trust. Amanda Phillips, Clinical Specialist Physiotherapist, Cambridgeshire Community Services NHS Trust said: “We are delighted Mr Djanogly was able to visit our physiotherapy department. We were able to show him our face to face physiotherapy services including the gym and treatment area at Hinchingbrooke Hospital, as well as our award-winning Physio Direct service. Victor Lucas, Chairman, Cambridgeshire Community Services NHS Trust who accompanied Mr Djanogly said: “We welcome Mr Djanogly’s visit today and his support for our ambitious plans for the future. “We launched our public consultation in January to become one of the country’s first community NHS Foundation Trusts and I am absolutely delighted to welcome Mr Djanogly as a member. Mr Djanogly said: “I was delighted to meet the Physiotherapy team and see and hear about how they are developing community physiotherapy services. Huntingdon residents are benefitting from the work the team have put into reviewing how services can be locally accessible to give the best possible care. “I commend the Trust for their commitment to engaging local people through this public consultation and am delighted to sign up as a member. The consultation started on 5 January 2011 and will finish on 30 March 2011.